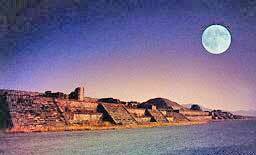 "When Tenochtitlan attained its greatness, the Toltec capital of Tula had already been recalled as the legendary Tollan. And when the Toltecs had built their city, Teotihuacan was already enshrined in myth. Its name has meant "Place of the Gods"; and that, according to recorded tales, was exactly what it had been. Pyramid of the Moon and Plaza. These Pyramids are connected by the Avenue of the Dead, nearly five straight miles long. "....The tale is intimately connected with Teotihuacan’s most renowned monuments, the Pyramid of the Sun and the Pyramid of the Moon (click image right). One version has it that the gods built the two pyramids to commemorate the two gods who had sacrificed themselves; another version states that the pyramids had already existed when the event was taking place, that the gods jumped into the divine fire from atop preexisting pyramids. "Whatever the legend, the fact is that the Pyramid of the Sun and the Pyramid of the Moon still rise majestically to this very day.... Rising in a valley whose surrounding mountains act as a backdrop to an eternal stage, the pyramids force the visitor’s eyes to follow their upward slope, to the mountains beyond and the vista of the skies above. The monuments exude power, knowledge, intent; the setting bespeaks a conscious linking of Earth with Heaven. No one can miss the sense of history, the presence of an awesome past. "How far back in the past?.... the date keeps slipping back.... In the 1950s a leading archaeologist, M. Covarrubias, incredulously admitted that radiocarbon dating gave the place "the almost impossible date of 900 B.C." (Indian Art of Mexico and Central America). In fact further radiocarbon test gave a date of 1474 B.C. (with a possible small error either way). A date of circa 1400 B.C. is now widely accepted; that is when the Olmecs, who may have been the people to actually toil in the building of Teotihuacan’s monumental structures, were establishing great "ceremonial centers" elsewhere in Mexico. "....Some scholars read in the ruins a tale that may have begun 6,000 years ago - in the fourth millennium B.C. This would certainly conform to the Aztec legends that spoke of this Place of the Gods as existing in the Fourth Sun. Then when the Day of Darkness happened circa 1400 B.C., the two great pyramids were raised to their monumental sizes. The Pyramid of the Moon and the Pyramid of the Sun are connected by the Avenue of the Dead (flanked by structures that were believed to be tombs). 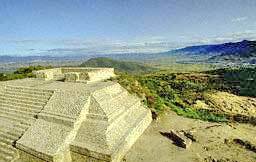 "Past the Pyramid of the Sun, and another 3,000 feet southwards, one reaches the Ciudadela, a quadrangle that contains at its eastern side the third pyramid of Teotihuacan, called the Quetzalcoatl Pyramid. It is now known that facing the Ciudadela, across the Avenue of the Dead, there existed a similar quadrangle that served mostly as a lay administrative-commercial center. The Avenue then continues further south; the Teotihuacan Mapping Project led by Rene Millon in the 1960s established that this north-south avenue extended for nearly five miles - longer than the longest runways at modern airports. In spite of this remarkable length, the wide avenue runs straight as an arrow - quite a technological feat at any time. "An east-west axis, perpendicular to the north-south avenue, extended eastward from the Ciudadela and westward from the administrative quadrangle. Members of the Teotihuacan Mapping Project found south of the Pyramid of the Sun a marker chiseled into the rocks in the shape of a cross within two concentric circles; a similar marker was found about two miles to the west, on a mountainside. A sight line connecting the two markers precisely indicates the direction of the east-west axis, and the other arms of the crosses match the orientation of the north-south axis. The researchers concluded that they had found markers used by the city’s original planners; they did not offer a theory to explain what means were used in antiquity to draw a beadline between two such distant spots. "That the ceremonial center had been oriented and laid out deliberately is evident from several other facts. The first one is that the San Juan river that flows in the Teotihuacan valley has been deliberately diverted where it crosses the ceremonial center: artificial channels divert the river to flow at the Ciudadela and along the quadrangle facing it exactly parallel to the east-west axis, then after two precise right-angle turns along the west-leading avenue. "The second fact indicating a deliberate orientation is that the two axes are not pointing to the cardinal points but are tilted to the southeast by 15 1/2 degrees. 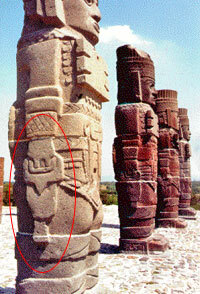 Studies show that this was not an accident or a miscalculation by the ancient planners. A.F. Aveni (Astronomy in Ancient Mesoamerica), calling this a "sacred orientation," points out that later ceremonial centers (such as Tula and ones even further away) adhere to this orientation although it made no sense at their locations and when they were built. The conclusion of his researches was that, at Teotihuacan and at the time of its construction, the orientation was devised to enable celestial observations on certain key dates of the calendar. "Zelia Nuttal, in a paper delivered to the twenty-second International Congress of Americanists (Rome, 1926) suggested that the orientation was keyed to the passage of the Sun at the observer’s zenith, which occurs twice a year as the Sun appears to move from north to south and back. If such celestial observations were the purpose of the pyramids, their ultimate shape - step pyramids equipped with staircases, leading to presumed viewing-temples on the topmost platform - would make sense.... 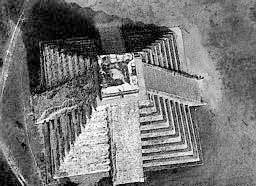 The possibility, even probability, that the stairways were a late addition is suggested to us by the fact that the first stage of the grand stairway of the Sun Pyramid is tilted and improperly aligned with the pyramid orientation. 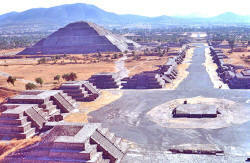 "Of the three pyramids at Teotihuacan the smallest is the Quetzalcoatl pyramid in the "Citadel." A later addition was partly excavated to reveal the original step-pyramid. The partly exposed facade reveals sculptured decorations in which the serpent symbol of Quetzalcoatl alternates with a stylized face of Tlaloc against a background of wavy waters. 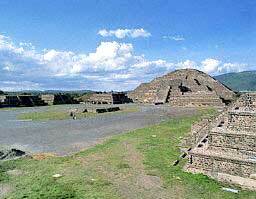 This pyramid is ascribed to Toltec times and is akin to many other Mexican pyramids. "The two larger pyramids, by contrast, are totally undecorated. They are of a different size and shape and stand out in their massiveness and antiquity. In all these aspects they resemble the two great pyramids at Giza, which likewise differ in all these counts from all the other, subsequent Egyptian pyramids; the latter were built by Pharaohs, whereas the unique ones at Giza were built by the "gods." Perhaps that is also what had happened at Teotihuacan; in which case the archaeological evidence would support the legends of how the Pyramid of the Sun and the Pyramid of the Moon had come to be. "Although, in order to enable their use as observatories, the two great pyramids of Teotihuacan were built as step-pyramids topped by platforms and equipped with stairways (as the Mesopotamian ziggurats had been), there can be no doubt that their architect was acquainted with the Giza pyramids in Egypt and, except for adjusting the outer shape, emulated the great Giza pyramids. 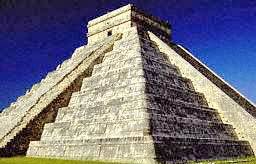 One amazing similarity: although the Second Pyramid at Giza is shorter than the Great Pyramid, their peaks are at the same height above sea level because the Second Pyramid is built on correspondingly higher ground; the same holds true at Teotihuacan, where the smaller Pyramid of the Moon is built on ground some thirty feet higher than the Pyramid of the Sun, giving their peaks equal heights above sea level. "The similarities are especially obvious between the two greater pyramids. Both are built on artificial platforms. Their sides measure almost the same: about 754 feet in Giza, about 745 feet at Teotihuacan, and the latter would fit neatly into the former. "....One need not ignore the existence of certain and considerable differences. The Great Pyramid at Giza is built of large stone blocks carefully shaped and matched and held together without mortar.... The Sun Pyramid was built of mud bricks, adobe, pebbles, and gravel, held together by a sheath of crude stones and stucco. The Giza pyramid contains an inner complex of corridors, galleries, and chambers of intricate and precise construction; The Teotihuacan pyramid does not appear to have such inner structures.... The Great Pyramid has four triangular sides that rise at the tricky angle of 52 degrees; the two at Teotihuacan consist of stages that rest one atop the other, with sides that slope inward for stability, beginning with a slope of 43 1/2 degrees. "These are significant differences that reflect the different times and purposes of each set of pyramids. But in the very last difference lies, hitherto unnoticed to all previous researchers, a key to the solution of some puzzles. "The rather steep angle of 52 degrees has been attained in Egypt only in the Giza pyramids, which were built neither by Cheops or any other Pharaoh (as proven in previous books of The Earth Chronicles) but by the gods of the ancient Near East, as beacons for landing at their spaceport in the Sinai peninsula. "....Pharaoh Sneferu failed with his first pyramid, it collapsed.... his second one had to conform with the 43 1/2 degrees, which was called the Bent Pyramid.... Sneferu then proceeded to build his third one, it is called the Red Pyramid for the color of its stones and it rises at the safe angle of 43 1/2 degrees. "....Is it only a coincidence that the Pyramid of the Sun and the Great Pyramid of Giza have the same base measurements? Perhaps. It is by mere chance that the precise 43 1/2 degree angle adopted by the Pharaoh Zoser and perfected in his step-pyramid was followed at Teotihuacan? We doubt it. Whereas a shallower angle, say 45 degrees, could have been attained by an unsophisticated architect simply by diving in two a right angle (90 degrees), the 43 1/2 degree angle resulted in Egypt from a sophisticated adaptation of the factor Pi (about 3.14), which is the ratio of a circle’s circumference to its diameter. "....How then did the 43 1/2 degree angle appear in the structures of the two unique (to Mesoamerica) pyramids of Teotihuacan, if not through someone familiar with the constructions of the Egyptian pyramids? "Except for the unique Great Pyramid of Giza, Egyptian pyramids were equipped only with a lower passageway that usually began at or near the edge of the pyramid’s base and continued under it. Should one ascribe as mere coincidence the existence of such passageway under the Pyramid of the Sun? "....What was the purpose of the complex subterranean structure? 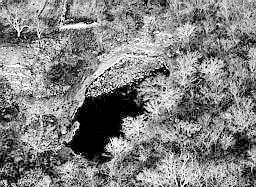 Since the segmenting walls had been breached before the discovery in modern times, it is not possible to say whether the remains of clay vessels, obsidian blades and charcoal ashes belong to the earliest phase of the tunnel’s use. But the question of what, besides celestial observation, was going on at Teotihuacan, has been compounded by other discoveries. "The Avenue of the Dead seems to stretch as a wide, smooth runway from the plaza of the Pyramid of the Moon to the southern horizon; but in fact its smooth flow is interrupted in a section situated between the Pyramid of the Sun and the San Juan river. The overall slope from the Pyramid of the Moon to the Pyramid of the Sun is even more accentuated in this section of the Avenue, and the on-site examination clearly indicates that the slope was achieved by deliberate cutting into the native rock; overall, the drop from the Pyramid of the Moon to a point past the Ciudadela is some ninety feet. Here six segments have been created by the erection of a series of double walls perpendicular to the course of the Avenue. The Avenue’s cavity is further lined with walls and low structures, resulting in six semi subterranean compartments open to the sky. The perpendicular walls are fitted with sluices at their floor level. The impression is that the whole complex served to channel water that flowed down the Avenue. The flow may have begun at the Pyramid of the Moon (where a subterranean tunnel was found encircling it), and been linked in some manner to the subterranean tunnel of the Pyramid of the Sun. The series of compartments then retained and eventually let out the water from one to the other, until ultimately the water reached the diverting channel of the San Juan river. "The association of this inland site is further suggested by the discovery of a huge stone statue of Chalchiuhtlicue, the goddess of water and the spouse of Tlaloc, the rain god. "....In her pictorial depictions, the goddess, whose name means "Lady of Waters," was usually shown wearing a jade skirt decorated with conch shells.... turquoise earrings and a necklace of jade or other blue-green stones from which hung a golden medallion.... Her pictorial depictions often showed her wearing a crown of serpents or otherwise adorned with them, indicating her being one of the serpent gods of the Mexicans. "Was Teotihuacan laid out and constructed as some kind of a waterworks, employing water for some technological processes? Before we answer the question, let us mention another puzzling discovery there. "Alongside the third segment down from the Pyramid of the Sun, excavations of a series of interconnected subterranean chambers revealed that some of the floors were covered with layers of thick sheets of mica. This is a silicone whose special properties make it resistant to water, heat, and electrical currents. It has therefore been used as an insulator in various chemical processes and electrical and electronic applications, and in recent times in nuclear and space technologies. 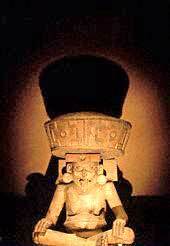 "....According to expert opinions, the mica found at Teotihuacan is of a type that is found only in faraway Brazil. Traces of this mica were also found on remains removed from the Pyramid of the Sun’s stages when it was being uncovered early in this century. What was the use to which this insulating material was put at Teotihuacan? "Our own impression is that the presence of the Lord and Lady of Water alongside the principal deity, Quetzalcoatl; the sloping avenue; the series of structures, subterranean chambers, tunnels; the diverted river; the semi subterranean sections with their sluices; and the underground compartments lined with mica - were all components of a scientifically conceived plant for the separation, refining or purification of mineral substances. "....Who, besides the gods, were the original dwellers of Teotihuacan? Who had carried the stones and mortar to raise its first pyramids? Who had channeled the waters and operated the sluices? 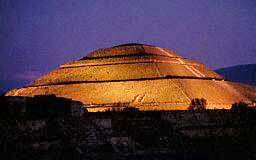 "Those who assume that Teotihuacan is no older than a few centuries B.C. 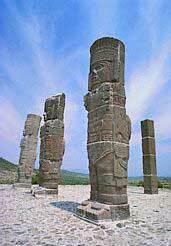 have a simple answer: the Toltecs. Those who lean toward a much earlier beginning have started to point to the Olmecs, an enigmatic people who emerged in the Mesoamerican scene in the middle of the second millennium B.C. But the Olmecs themselves pose many puzzles, for they appear to have been black Africans; and that too is anathema to those who simply cannot accept transatlantic crossing millennia ago. "....Circa 200 B.C. whoever had lorded over Teotihuacan picked up and left, and the place became a Toltec city.... Then, a thousand years after they had drifted in, (centuries preceding the Christian era) the Toltecs too packed up and left. No one knows why; but the departure was total and Teotihuacan became a desolate place, living only in memories of a golden past. 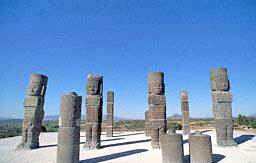 "Some believe that the event coincided with the establishment of Tollan as the Toltecs’ new capital, circa A.D. 700.... The rediscovery began toward the end of the nineteenth century.... confirmed not only the city’s existence but also its history as told in various codices, especially the one known as Anales de Cuauhtitlan. It is now known that Tollan was ruled by a dynasty of priest-kings who claimed to have been descendants of the god Quetzalcoatl and therefore, in addition to their given name, also bore the god’s name as a patronym - a custom that was prevalent among the Egyptian pharaohs.... 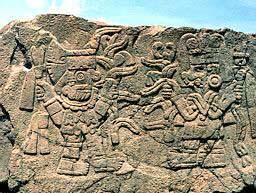 In the second half of the tenth century A.D. the ruler was Ce Acatl Topiltzin-Quetzalcoatl; his name and time are certain because a portrait of his, accompanied by a date equivalent to A.D. 968, can still be seen carved on a rock overlooking the site of the city. "It was in this time that a religious conflict broke up out among the toltecs; it seems that it concerned the demand by part of the priesthood to introduce human sacrifices in order to pacify the War God. In A.D. 987 Topiltzin-Quetzalcoatl and his followers left Tollan and migrated eastward, emulating the early legendary departure of the divine Quetzalcoatl. They settled in Yucatan. "Two centuries later natural calamities and onslaughts by other tribesmen brought the Toltecs to their knees.... Thus it was that in A.D. 1168 or thereabouts Tollan became a desolate city, left to decay and disintegrate. 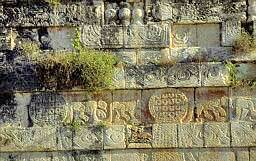 Carved Wall of the Pyramid of the Feathered Serpent. 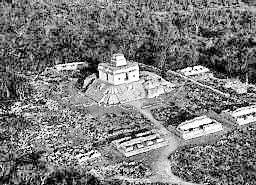 Mr. Sitchin continues describing in several subsequent paragraphs, the findings of artifacts and studying the plans of the city, which was emulating Teotihuacan. Major findings were also achieved in the 1940s under Jorge R. Acosta.... Work was focused on the smaller pyramid that has variably been referred to (at first) as Pyramid of the Moon, then as Pyramid "B" and lately as the Qetzalcoatl Pyramid. The designation stems primarily from the long native name for the mound that means "Lord of the Morning Star," presumably one of the epithets of Quetzalcoatl, and from the remain of colored plasterwork and low reliefs that adorned the pyramid’s stages, evidencing that its decorations were dominated by the Featherd Serpent motif. 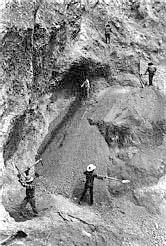 "The greatest archaeological treasure trove was found when the Acosta teams realized that the northern side of this pyramid was disturbed in pre-Hispanic times.... the archaeologists found a trench, which was as high as the pyramid.... was used to bury in it a great number of stone sculptures. When these were taken out, stood up and fitted together, it became clear that these were sections of the two round gateway columns, four square columns that are believed to have held up the roof of the pyramid’s temple, and four colossal humanlike statues, more than fifteen feet high that came to be known as the Atlantes.... The facial features are not readily identifiable and so far have defied comparison with any known racial group; but although the four faces hold the same remote expression, a close examination shows them to be slightly different and individual. 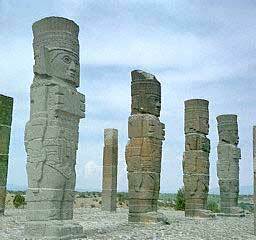 "Whom do these giant statues represent? Their first discoverers called them "idols," certain that they represented deities. Popular writers nicknamed them Atlantes, which implied both that they might have been offspring of the Goddess Atlatona, "She Who Shines in the Water," and also that they might have come from the legendary Atlantis. Less imaginative scholars see them simply as Toltec warriors, who hold in their left hand a bunch of arrows, and an atl-atl (a curved spear or arrow thrower) in the right hand. But this interpretation cannot possibly be correct, for the "arrows" in the left hand are not straight but curved; and we have seen that the left-handed weapon was the atl-atl. At the same time, the weapon held in the right hand is not curved as the atl-atl must be, what is it, then? Detail showing of Atlantes at the Temple of the Morning Star. "The instrument looks rather like a pistol (image below-left) in its holster held by two fingers. An interesting theory suggesting that it was not a weapon but a tool, a "plasma pistol," was advanced by Gerardo Levet (Mision Fatal). He discovered that one of the square pilasters depicting Toltec chieftains has, engraved in an upper left-hand corner, the image of a person wearing a backpack and holding the tool in question; he uses it as a flame thrower to shape a stone. The tool is unquestionably the same instrument held in the giants’ right hands. Levet suggests that it was a high energy "pistol" that used to cut and carve stones, and he points out that such Thermo-Jet torches were used in modern time to carve the giant monument of Georgia’s Stone Mountain. "....On the other hand, the depicted tool may serve to explain another enigmatic aspect of Tollan. "....The archaeologists (Acosta’s) discovered that the external and visible pyramid was built over and hid an earlier pyramid whose stepped stages lay some eight feet away on each side. They also discovered remains of vertical walls that suggested the existence of inner chambers and passages within the earlier pyramid (but have not pursued these leads). They did come upon an extraordinary feature - a stone pipe made of perfectly fitting tubular sections with an inner diameter of about eighteen inches. The long pipe was installed inside the pyramid at the same angle as its original incline and ran through the whole height.... The position and incline of the unusual, if not unique, tubular contraption was obviously part of the original plan of the pyramid and integral to the structure’s purpose. The fact that the remains of the adjoining multichambered and multistored buildings suggest some industrial processing, and also the fact that in antiquity water from the Tula river was channeled by these buildings, raise the possibility that at this site, as at Teotihuacan, some kind of a purification and refining process had taken place at a very early period. "What comes to our mind is this: Was the enigmatic tool a tool not to engrave stones, but to break up stones for their ores? Was it, in other words, a sophisticated mining tool? "And was the mineral sought after, gold? "....The fact that at some pre-Hispanic time the colossal images were disassembled and carefully lowered into the depths of the pyramid and buried there, implies a measure of sanctity. Indeed, it all confirms the statement by Sahagun.... that when the Toltecs abandoned Tollan "they buried many things" some of which, even in Sahagun’s time, "were brought up from under the ground and not without admiration for their beauty and workmanship." "....The four Atlanteans stood atop the Pyramid of Quetzalcoatl, supporting the ceiling of the temple atop the pyramid as though they were holding up the Celestial Canopy. This is the role played in Egyptian beliefs by the four sons of Horus, who were holding up the sky at the four cardinal points. According to the Book of the Dead, it was these four gods, who linked Heaven and Earth, who accompanied the deceased pharaoh to a sacred stairway whereby he would ascend heavenward for an eternal afterlife. This "Stairway to Heaven" was depicted hieroglyphically as either a single or a double stairway, the latter representing a step pyramid. Was it just a coincidence that the stairway symbol decorated the walls around the Tollan pyramid and became a major Aztec iconographic symbol? Mayan sculpture of Winged Serpent. Human figure standing atop the head of a Winged Serpent. Chichen Itza, Mexico. "....Quetzalcoatl (the Nahuatl peoples’s hero-god), giver of all their knowledge, the "Feathered Serpent." But what, one may ask, was a "feathered" serpent if not a serpent that, birdlike, had wings and could fly? "And if so, the concept of Quetzalcoatl as the "Feathered Serpent" was non other than the Egyptian concept of the Winged Serpent that facilitated the transfiguration of the deceased pharaoh to the realm of the ever-living gods. "In addition to Quetzalcoatl, the Nahuatl pantheon was replete with deities associated with serpents. "....And so, unacceptable as this might be to pragmatic scholars, mythology, archaeology, and symbolism led to the unavoidable conclusion that Central Mexico, if not all of Mesoamerica, was the realm of the Serpent Gods - the gods of ancient Egypt. "The Maya mystique seized the imagination and curiosity of Europeans from the moment the Spaniards first set foot in the Yucatan peninsula and saw the vestiges of cities lost in the jungle. "....With other interests in their minds, such as the search for riches and the conversion of the natives to Christianity, it took nearly two centuries for the Spaniards to turn their attention to the ruins. 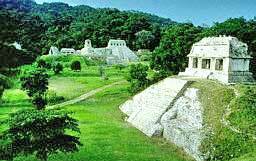 It was only 1785 that a royal commission inspected the then-discovered ruins of Palenque. Lord Kingsborough, and Landa have been an invaluable source of data on the Maya past. "But in the popular mind, the honor of launching the archaeological discovery of the Maya civilization belongs to a native of New Jersey, John L. Stephens. 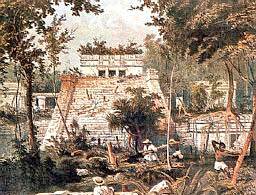 Appointed U.S. envoy to the Central American Federation, he went to the Maya lands with his friend Frederick Catherwood, an accomplished artist. "....The team’s reports were especially detailed regarding the great sites of Palenque, Uxmal, Chichen Itza, and Copan.... Of particular importance was the realization that some of the symbols and glyphs carved upon the monuments in fact stated the date thereof, so that the Maya civilization could be placed in a time frame. "....We could have known much more about the Maya from their own extensive literature - books that were written on paper made from tree barks and laminated with white lime to create a base for the inked glyphs. But these books, by the hundreds, were systematically destroyed by the Spanish priests - most notable by the very same Bishop Landa who ended up being the one who preserved much of the "pagan’ information in his own writings. "Only three (or, if authentic, a fourth) codices ("picture books") have remained. The parts scholars find most interesting in them are the sections dealing with astronomy. Two other major literary works are also available because they had been rewritten, either from original picture-books or from oral traditions, into the native tongues but using Latin script. "One of these is the books of Chilam Balam, meaning the Oracles of Utterings of Balam the priest.... Balam, it appears, was a kind of a Maya "Edgar Cayce"; the books record information regarding the mythical past and the prophetic future, on rites and rituals, astrology, and medical advice. "The word balam means "jaguar" in the native tongue, and has caused much consternation among scholars, for it has no apparent connection with oracles. We find it intriguing, however, that in ancient Egypt a class of priests called Shem-priests, who pronounced oracles during certain royal ceremonies as well as secret formulas intended to "Open the Mouth" so that a deceased pharaoh could join the gods in the Afterlife wore leopard skins. Maya depictions of similarly clad priests have been found; since in the Americas this would have to be a jaguar skin rather than that of an African leopard, this could explain the "jaguar" meaning of the name of Balam. It would also indicate, once more, an Egyptian ritual influence. Mayan Ruins at Copan, Honduras. "We are even more intrigued by the similarity of this name of the Maya oracle-priest to that of the seer Balaam, who, according to the Bible, was retained by the king of Moab during the Exodus to put a curse on the Israelites, but who ended up being pronounced their favorable oracle. Was this just a coincidence? "The other book is the Popol Vuh, the "Council Book" of the highland Maya. It gives an account of divine and human origins and of royal genealogies; its cosmogony and creation traditions are basically similar to those of the Nahuatl peoples, indicating a common original source. Regarding Maya origins the Popol Vuh states that their forefathers had come "from the other side of the sea." Landa wrote that the Indians "have heard from their ancestors that his land was occupied by a race of people who came from the East and whom God had delivered by opening twelve paths through the sea." 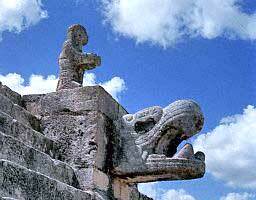 These statements are in accord with a Maya tale known as the Legend of Votan.... The legend relates the arrival in Yucatan, circa 1000 B.C. by the chronicler’s calculations, of "the first man whom God had sent to this region to people and parcel out the land that is now called America." His name was Votan (meaning unknown); his emblem was the Serpent. "He was descendant of the Guardians, of the race of Can. His place of origin was a land called Chivim." He made a total of four voyages. The first time he landed he established a settlement near the coast. After some time he advanced inland and "at the tributary of a great river built a city which was the cradle of this civilization." He called the city Nachan, "which means Place of Serpents." 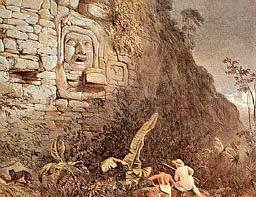 On his second visit he surveyed the newfound land examining its subterranean zones and underground passages; one such passage was said to have gone right through a mountain near Nachan. When he returned to America the fourth time he found discord and rivalry among the people. So he divided the realm into four domains, establishing a city to serve as the capital of each. 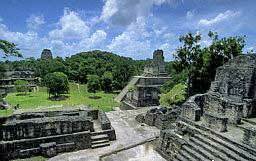 Palenque is mentioned as one of them; another appears to have been near the Pacific coast. The others are unknown. "....Zelia Nuttal.... pointed out that the Maya word for serpent, Can, paralleled the Hebrew Canaan. If so, the Maya legend, telling that Votan was of the race of Can and his symbol was the serpent, could be using a play of words to state that Votan came from Canaan. This certainly justifies our wondering why Nachan, "Place of Serpents," is virtually identical to the Hebrew Nachash that means "serpent." "Such legends strengthen the scholarly school that considers the Gulf Coast as the place where Yucatec civilization began - not only of the Maya, but also of the earlier Olmecs. In this view much consideration has to be given to a site that is little known to visitors, which belongs to the very beginnings of Maya culture "between 2000 and 1000 B.C. if not earlier," according to its excavators from Tulane University - National Geographic Society. 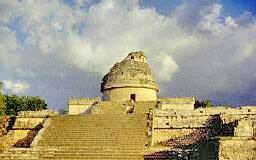 Called Dzibilchalum, it is situated near the port city Progreso on Yucatan’s northwest coast. The remains, extending over an area of twenty square miles, reveals that the city was occupied from the earliest times through Spanish times, its edifices having been built and rebuilt and overbuilt, and its cut and ornamented stones having been hauled away to be used in Spanish and modern constructions near and far. Besides immense temples and pyramids, the city’s outstanding feature is a Great White Way, a cause way paved with limestones that ran straight for a mile and a half as an east-west axis to the city. Used as an offering well. Castle at Tulum overtaken by vegetation. From John Lloyd’s Stephens Voyage to Yucatan, by Frederick Catherwood. "Notwithstanding all this legendary and archaeological evidence, another school of archaeologists believes that Maya culture - or at least the Mayas themselves - originated in the southern highlands (today’s Guatemala), spreading from there northward. Studies of the Maya language trace its origin to a "a proto-Maya community that, perhaps around 2600 B.C. existed in what is now the departments of Huehuetenango in northwest Guatemala." (D.S. 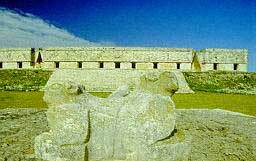 Morales, The Maya World). 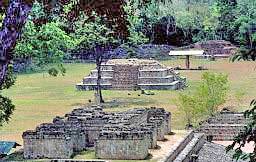 "But wherever and however Maya civilization developed, scholars consider the second millennium B.C. as its "Pre-Classic" phase and the beginning of the "Classic" phase of maximal achievement circa A.D. 200; by A.D. 900 the realm of the Maya extended from the Pacific coast to the Gulf of Mexico and the Caribbean.... And then, five centuries before the Spanish arrival, for reasons unknown, the Maya abandoned their sacred cities and let the jungle take them over. 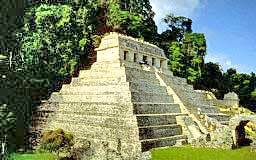 "Palenque, one of the earliest Maya cities.... its fame and allure took off only after the discovery in 1949 (by Alberto Ruiz Lhuillier) that the stepped pyramid called the Temple of Inscriptions contained a secret internal stairway that led all the way down. Several years of excavation and removal of the soil and debris that fell and hid the inner structure yielded in the end a most exciting discovery: a burial chamber. At the bottom of the twisting stairway a triangular stone block masked an entranceway through the blank wall that was still guarded by the skeletons of Maya warriors. Behind there was a vaulted crypt, its walls painted with murals. Within, a stone sarcophagus was covered by a large rectangular stone slab that weighs about five tons and is 12 1/2 feet long. When this stone lid was moved, there came into view the skeletal remains of a tall man, still bedecked with pearls and jade jewelry. His face was covered with a mosaic jade mask; a small jade pendant bearing the image of a deity lay among the beads that once were a jade collar. was the image of a barefoot Maya sitting upon a plumed or flaming throne and seemingly operating mechanical devices inside an elaborate chamber. The Ancient Astronaut Society and its sponsor, Erich Von Daniken, have seen in this a depiction of an astronaut inside a spacecraft driven by flaming jets. They suggest that an Extraterrestrial is buried here. "Archaeologists and scholars ridicule the idea. Inscriptions of the walls of this funerary edifice and in adjoining structures convince them that the person buried here is the ruler Pacal ("Shield") who reigned in Palenque in A.D. 615-683. Some see in the scene a depiction of the deceased Pacal being taken by the Dragon of the Underworld to the realm of the dead; they consider the fact that at the winter solstice the Sun sets exactly behind the Temple of Inscriptions as added symbolism of the king’s departure with the setting Sun God. Others, prompted to revised interpretations by the fact that the depiction is framed by a Sky Band, a chain of glyphs that represent celestial bodies and the zodiac constellations, regard the scene as showing the king being carried by the Celestial Serpent to the celestial realm of the gods. The crosslike object that the deceased is facing is now recognized as a stylized Tree of Life, suggesting that the king is being transported to an eternal afterlife. "In fact a similar tomb, known as Burial 116, was discovered in the Great plaza of Tikal, at the foot of one of its major pyramids. "....All considered, scholars have admitted that "one cannot avoid an implicit comparison to the crypts of the Egyptian pharaohs. The similarities between the tomb of Pacal and those who ruled earlier beside the Nile are striking" (H. La Fay "The Maya, Children of Time" in the National Geographic Magazine). Indeed, the scene on Pacal’s sarcophagus conveys the very same image as that of a pharaoh transported, by the Winged Serpent, to an eternal afterlife among the gods who came from the heavens. The pharaoh who was not an astronaut, had become one upon his death; and that, we suggest, is what the carved scene has implied for Pacal. 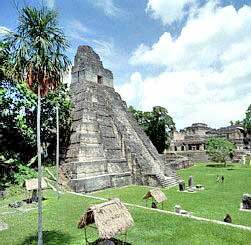 "....The construction of an airstrip near Tikal’s ruins speeded up its exploration after 1950 and extensive archaeological work has been conducted there especially by teams from the University Museum, University of Pennsylvania. They discovered that the great plazas of Tikal served as a necropolis, where rulers and noblemen were buried; also, that many of the lesser structures were in fact funerary temples, built not over the tombs but next to them and serving as cenotaphs. They also uncovered about one hundred and fifty stelas, carved stone slabs erected mostly so as to face either east or west. They depict, it was ascertained, portraits of actual rulers and commemorate major events in their lives and reigns. The hieroglyphic inscriptions carved upon them recorded accurate dates associated with these events, named the ruler by his hieroglyph (here "Jaguar Paw Skull," A.D. 488) and identified the event; the textual hieroglyphs, scholars are by now certain, were not merely pictorial or ideographic "but also written phonetically in syllables similar to those of Sumerian, Babylonian, and Egyptian" (A.G. Miller, Maya Rulers of Time). "....But as ongoing discoveries and excavations have shown, site after new site in Guatemala, Honduras, and Belize indicates the existence of monuments and dated stelas as early as 600 B.C., revealing a developed system of writing that , all scholars agree, must have had a prior developmental phase or source. "Students of the Maya civilization have been especially impressed by the accuracy, ingenuity and diversity of Maya time reckoning, attributing them to an advanced Maya astronomy. "The Maya had, indeed, not one but three calendars, but one - the most significant one in our opinion - had nothing to do with astronomy. It is the so called Long Count. It stated a date by counting the number of days that had passed from a certain starting day to the day of the event recorded by the Maya on the stela or monument. The enigmatic Day One, most scholars now agree, was August 13, 3113 B.C. according the current Christian calendar - a time and an event that clearly preceded the emergence of the Maya civilization. "....But, as stated, in their actual calendrical dating on their monuments, the Maya went back not to the age of the dinosaurs but to a specific day, an event as crucial to them as the date of Christ’s birth is to the followers of the Christian calendar. Thus Stela 29 at Tikal, which bears the earliest date so far found on a royal monument there (A.D. 292), gives the Long Count date of a total of 1,243, 615 days. "Dividing the 1,243,615 days by the number of days in a solar year, 364 1/4, the date on the stela states that it, or the event depicted on it, occurred 3,404 years and 304 days after the mysterious Day One; i.e., since August 13, 3113 B.C. Therefore, according to the now accepted correlation, the date on the stela is A.D. 292 (3,405 - 3,113 = 292). Some scholars see evidence that the Maya began to use the Long Count in the era of Baktun 7, which equaled the fourth century B.C. ; others do not dismiss an even earlier use. Castillo Temple-Pyramid. 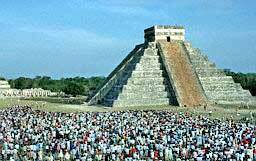 It might have symbolized the Maya Calendar Haab, Chichen Itza, Yucatan. "Alongside this continuous calendar there were two cyclical calendars. One was the Haab or Solar Year of 365 days that was divided into 18 months of 20 days, plus an additional 5 days at year’s end. "The other (cyclical calendar) was the Tzolkin or Sacred Year calendar in which the 20 basic days were rotated 13 times, resulting in a Sacred Year of 260 days. The two cyclical calendars were then meshed together, as though they were gear wheels driven by each other to create the grand Sacred Round of 52 solar years; for the combination of 13, 20, and 365 could not repeat itself except once in 18, 980 days, which equals 52 years. This Calendar Round of 52 years was sacred to all the peoples of ancient Mesoamerica and they related to it events both past and future - such as the messianic expectation of the return of Quetzalcoatl. Pyramid on Mt. Alban overlooking Oaxaca Valley, Mexico. "Some believe that this cycle is purely mathematical.... Others suggest that the period of 260 days had to do with agriculture.... In view of the Mayan propensity for astronomy, others attempt to somehow calculate a relationship between 260 days and the motions of Venus or Mars. One must wonder why a solution offered by Zelia Nuttal at the Twenty Second International Congress of Americanists (Rome, 1926) did not gain the full recognition it deserves. She pointed out that the easiest way for the people of the New World to apply seasonal movements of the Sun to their own locality was to determine Zenith Days, when the Sun passed precisely overhead at midday. This happens twice a year as the Sun appears to travel northward, then southward, passing overhead twice. The Indians, she suggested, measured the interval between the two Zenith Days and the resulting number of days became the basis for the Calendar Round.... The interval was precisely 260 days at latitude 14 degrees 42’ north - the latitude of Copan. 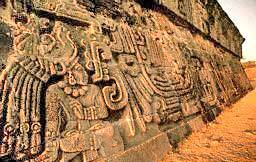 "....Copan was consider the astronomical capital of the Maya. Besides the usual celestial orientation of its edifices, some of its stelas have been found to be aligned for determining key calendar dates. "The main task of the local astronomers, it appears, was to keep verifying or adjusting the 260-day sacred year against data from earlier times that dealt with the movements of celestial bodies. Indeed, the most renown and still standing observatory in Yucatan, the Caracol in Chichen Itza, has frustrated successive researchers who have tried, in vain, to find in its orientation and aperture viewlines to the solstices or equinoxes. Some viewlines, however, do seem to be related to the Tzolkin 260-day cycle. El Caracol, Maya Observatory at Chichen Itza, Yucatan, Mexico . "The number 260 appears to have been an arbitrary, deliberate choice; the explanation that it results from multiplying a natural number, 20 (the number of fingers and toes), by 13 only shifts the problem to the question, Why and Wherefrom 13? The Long Count too contains an arbitrary number, 360; inexplicably it abandons the pure vigesimal progression and, after the kin (1) and uinal (20), introduces the tun (360) into the system. The Haab calendar also considers 360 as its basic length, dividing this number into 18 "months" of 20 days; it rounds off the year by the addition of 5 "bad days" to complete the solar cycle of 365. "All the three calendars thus are based on numbers that are not natural, numbers deliberately selected. 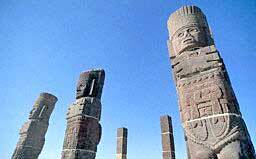 We will show that both 260 and 360 reached Mesoamerica from Mesopotamia - via Egypt. "We are all familiar with the number 360: it is the number of degrees in a circle. But few know that we owe the number to the Sumerians, and that it stems from their sexagesimal ("Base 60") mathematical system. 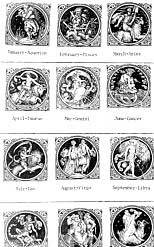 The first known calendar was the Nippur Calendar of the Sumerians; it was devised by dividing the circle of 360 into 12 parts, twelve being the sacred celestial number from which followed the twelve months of the year, the twelve houses of the zodiac, the twelve Olympian gods, and so on. The problem of the shortfall of 5 1/4 days was solved by intercalation - the addition of a thirteenth month after the passage of a number of years. "....The Sumerian imprint on the Egyptian and hence the Mesoamerican calendars was not limited to the sexagesimal number 360. Various studies, principally by B.P. Reko, in the early issues of El Mexico Antiguo, leave little doubt that the thirteen months of the Tzolkin calendar were in fact a reflection of the 12-month system of the Sumerians plus the thirteenth intercalary month, except that in Egypt ( and hence in Mesoamerica) the thirteenth month had shrunk to an annual 5 days. The term tun for 360 meant in the Maya language "celestial," a star or planet within the zodiacal band. Interestingly, a "heap of stars" - a constellation - was called Mool, virtually the same term MUL that the Sumerians had used to mean "celestial body." "The association of the Mesopotamian calendar with the Old World will become additionally evident as we look at the most sacred number, 52, to which all the great Mesopotamian events were geared. The many attempts to explain it (like the statement that it is 13 times 4) ignore its most obvious source: the 52 weeks of the Near Eastern calendar ( and thereafter the European one). This number of weeks, however, is arrived at only if a week of 7 days is adopted. This was not always the case. The origin of a 7-day week has been a subject of study for almost two centuries and the best theory is that it derived from the four phases of the Moon. What is certain is that it emerged as a divinely decreed time period in biblical times, when God commanded the Israelites during the Exodus from Egypt to observe the seventh day as the Sabbath. "....Although a deity whose epithet was "Seven" was a principal Sumerian god, he was honored with theophonic place (e.g., Beer-Sheba, The Well of Seven) or personal names Elisheva, (My God is Seven) principally in the land of Canaan. The number 7 as a revered number appears in the tales of the Hebrew patriarchs only after Abraham went to Egypt and stayed at the pharaoh’s court. The number 7 permeates the biblical tale of Joseph, the pharaoh’s dream and the ensuing events in Egypt. And, to the extent that 52 stemmed from the consideration of 7 as a basic calendrical unit, we will show that this most sacred cycle of Mesoamerica was of Egyptian origin. "More specifically: 52 was a magical number that was associated with the Egyptian god Thoth, the god of science, writing, mathematics, and the calendar. 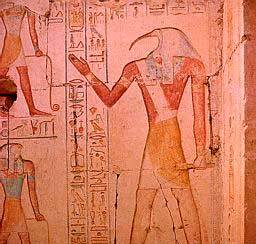 "The Adventures of Satni-Khamois with the Mummies"
....son of a pharaoh, "was well instructed in all things." He was wont to wander in the necropolis of Memphis (then the capital). He was in search of a book that the god Thoth had written with his own hands, "in which are revealed the mysteries of the Earth and the secrets of the Heavens...."
Satni had to remove the book, which was in a box of gold, inside a box of silver, that was inside a series of other boxes, the last and outer ones being of bronze and iron, from a Pharaoh’s tomb, the pharaoh was Nenoferkheptah ("scholars believe , that he reigned circa 1250 B.C. ), who although buried with his sister-wife and their son, they were not dead but in suspended animation, they could see, hear, and speak, this was a curse placed on them by Thoth when Nenoferkheptah stole the book. "There was a way to possess the book without incurring Thoth’s wrath, he said: it was to play and win the Game of Fifty-Two, the magical number of Thoth." Satni agreed. Unfortunately he lost the first and subsequent games, sinking in the ground a bit further down as he lost each game. 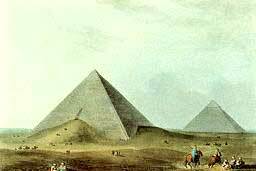 First and Second Pyramids of Giza. Ancient Memphis; by Luigi Mayer . "How he managed to escape with the book, the calamities that befell him as a result, and how he in the end returned it to its hiding place , make up the rest of this ancient version of "Raiders of the Lost Ark." "The tale’s moral was that no man, as knowledgeable as he might be, could learn the mysteries of the Earth, the Sun, the Moon, and the planets without divine permission; unauthorized by Thoth, Man will lose the Game of Fifty-Two. And he would lose it even if he tried to find out the secrets by opening up the protective layers of Earth’s minerals and metals. "It is our belief that it was the same Thoth, Alias Quetzalcoatl, who had bestowed the Calendar of Fifty-Two, and all other knowledge, upon the peoples of Mesoamerica. In Yucatan the Maya called him Kukulcan; in the Pacific regions of Guatemala and El Salvador he was called Xiuhtecuhtli; the names all mean the same: Feathered or Winged Serpent. "At first temples were lofted atop step pyramids to worship the Serpent God, and the skies were observed to watch for the key celestial cycles. But there came a time when the god - or all the celestial gods - had left. Seen no more, they were presumed to have been swallowed by the ruler of the night, the jaguar; and the image of the great god was hencefore covered by the jaguar’s mask, through which the serpents, his erstwhile symbol, still emerge. "But had no Quetzalcoatl promised to return? "Fervently the skywatchers of the jungles consulted ancient almanacs. Priests advanced the notions that the vanished deities would return if offered the throbbing hearts of human victims. "But at some crucial calendrical date in the ninth century A.D., a prophesied event failed to occur. All the cycles came together, and added up to naught. And so were the ceremonial centers and the deities dedicated to the gods abandoned, and the jungle cast its green mantle over the domain of the Serpent Gods.